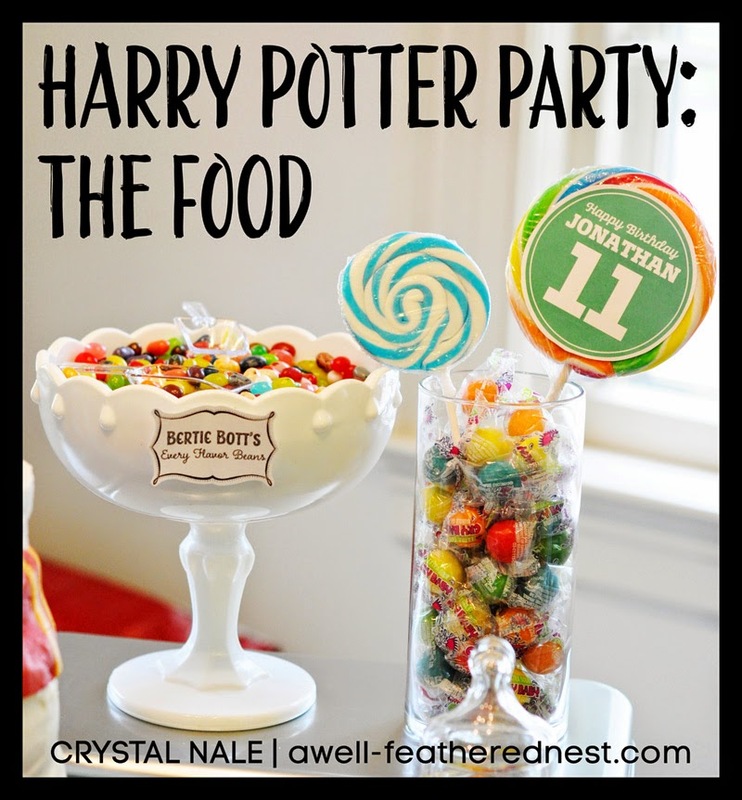 Today I'm sharing more details about our boys' Harry Potter birthday party, and I have to admit that the food was probably my favorite part. I looked at photos of Honeydukes in the Wizarding World for ages just hoping I could replicate a little bit of that atmosphere. My party planning began with a list of treats from the books and brainstorming what muggle-world candies might make good representation of each one. In the end, I did compromise a bit for the sake of budget knowing that most of the kids coming to the party would be clueless anyway. 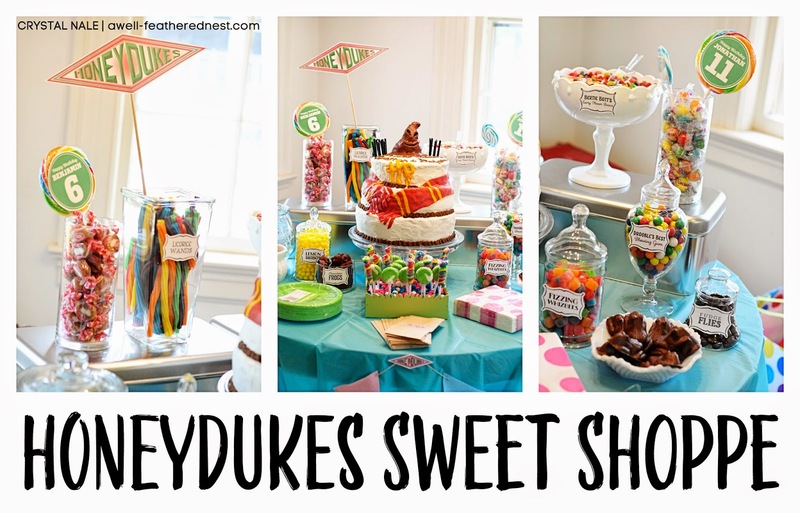 The main centerpiece of the whole party was the Honeydukes Sweet Shoppe table. I had so much fun obsessing collecting ideas for the display. This whole thing was kind of a once-in-a-lifetime thing for us, so this was my chance to create a remotely pin-worthy display. I experimented with a lot of different ideas, and I really found Amy Atlas' displays and all of the similar ones out there now to be very inspiring. 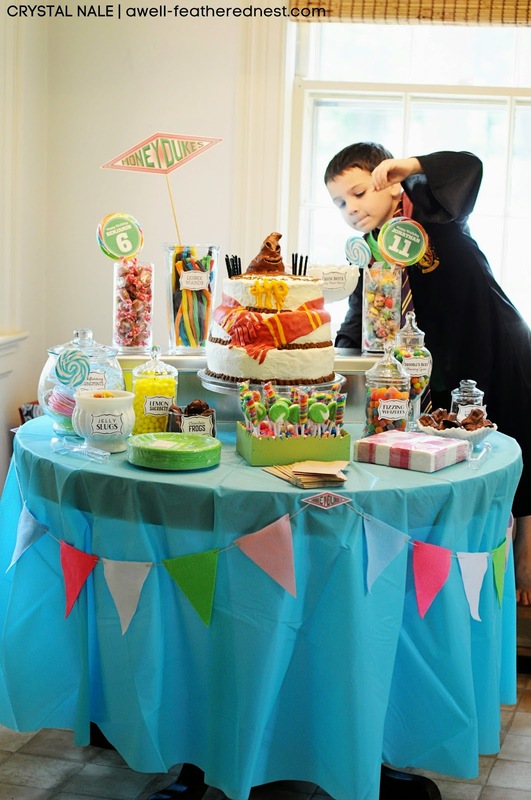 There are tons of ideas for candy buffets on Pinterest, too. So I had endless ideas to work with. I loved that Honeydukes allowed me to pull in some fun decorations that I never get to use having only boys around here. The pink polka dot napkins were my favorite. We found those at Wal-Mart, of all places. Most of the candy was readily available at Target or the Dollar Tree, but I did have to hunt down a few items. Here's what I ended up with. I really wanted some cute lollipops to decorate the table, but it was hard to find what I wanted in the town where we live. I did find the two biggest ones at Michael's, but I stopped into Party City when we were in Durham for a doctor's appointment, and they had tons of pretty candy. All of the smaller lollipops came from there. The blue ones were "It's a Boy!" ones, but I was able to easily remove the sticker. The awesome cake was made by my mom! Most of the dishes were found by rummaging through my cabinets. A few items were found at thrift stores, and the two on the outside in the back were purchased at the last minute at the Dollar Tree just to fill things in a bit. I looked forever for items to make a lollipop stand for the smaller ones. I had the hardest time finding what I wanted. In the end, I found the exact thing I needed at Hobby Lobby--only it was the display for a bunch of little pinwheels. So, I became the crazy lady and asked if I could have the display if I bought the last few pinwheels, and it totally worked. That saved me a couple of hours of work and several bucks! The plates were from Target. The tablecloth is from Hobby Lobby. The little clear scoops were super cheap from The Container Store, and the small clear tongs were from the Dollar Tree. I made the candy labels and cut them from card stock, and I found a Honeydukes logo here. I printed it for the sign and smaller stickers for the tiny paper bags and to hold up the pennant. The pennant was sooo easy--made from felt triangles and a bit of string. 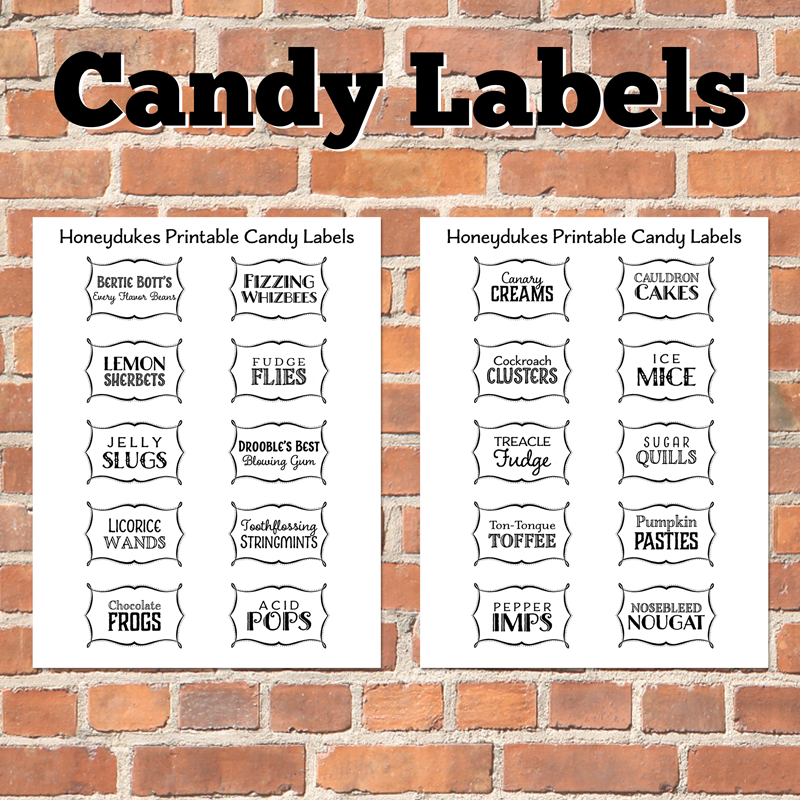 You can find the printable candy labels in my etsy shop here! For the drinks, we had Gillywater (Sierra Mist) and Butterbeer made to order. I found tons of different recipes for Butterbeer, and I went with a mash-up of a couple of different ones. I wanted something that could be mixed up quickly. I had an idea that the kids might not loooove the Butterbeer, and I didn't want to waste a lot of stuff by mixing it up ahead of time. Here's the recipe. I found the Butterbeer sign here, and the plastic frame came from Michael's. If I had more time and funds I could have gone all out for the ice cream display, but I committed to focus my efforts on the Honeydukes table. 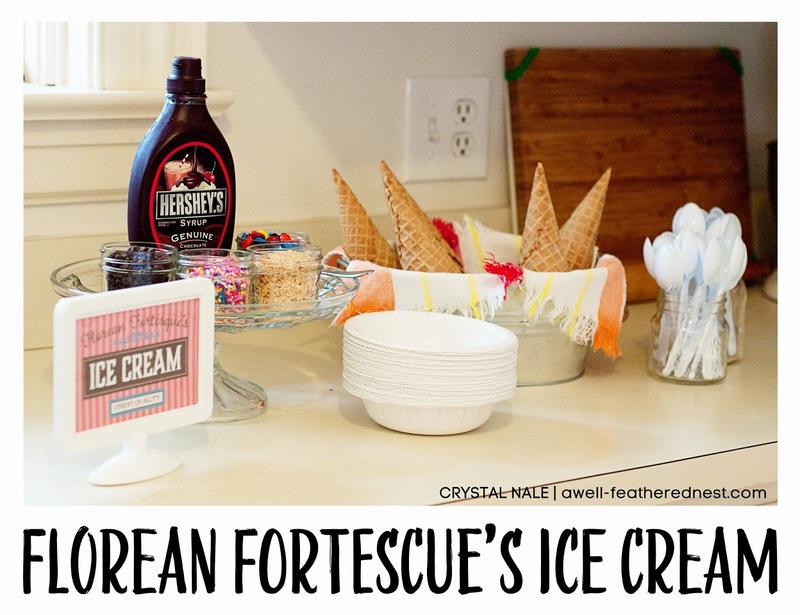 We had a couple of flavors of ice cream, cones or bowls, a few toppings, and some chocolate syrup. 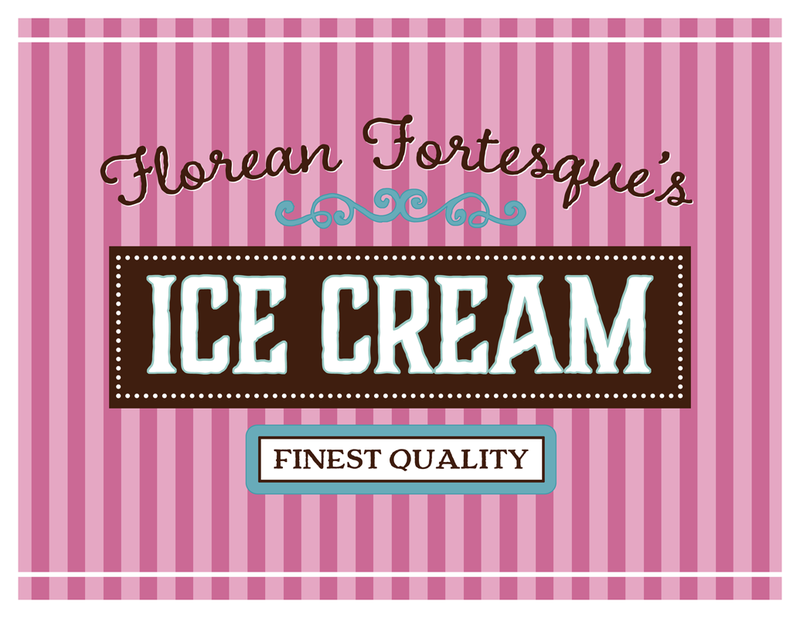 I'm sharing the Florean Fortescue's Ice Cream sign with you! 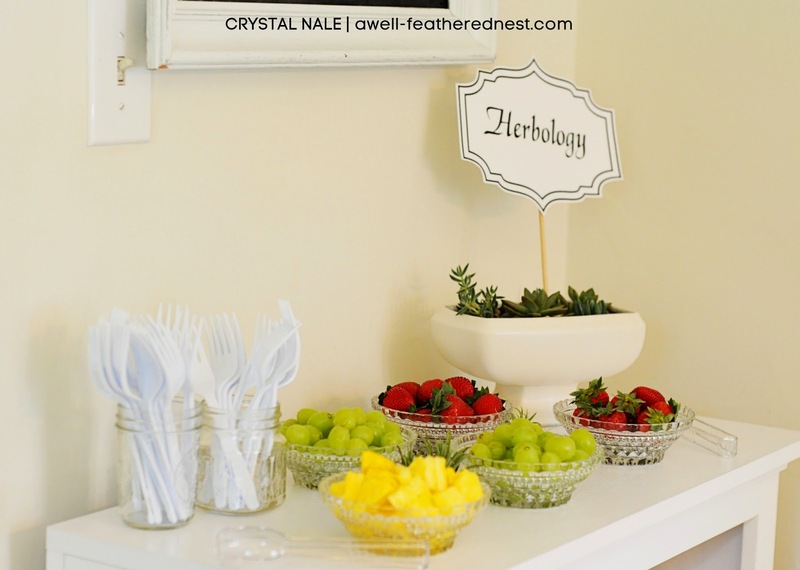 The Herbology table served to add a couple of nutrients to the food spread. Plus, I like a little fruit with my ice cream, anyway. This was the last thing I pulled together, so it was fairly simple. I may have just been looking for a good excuse to plant some succulents. 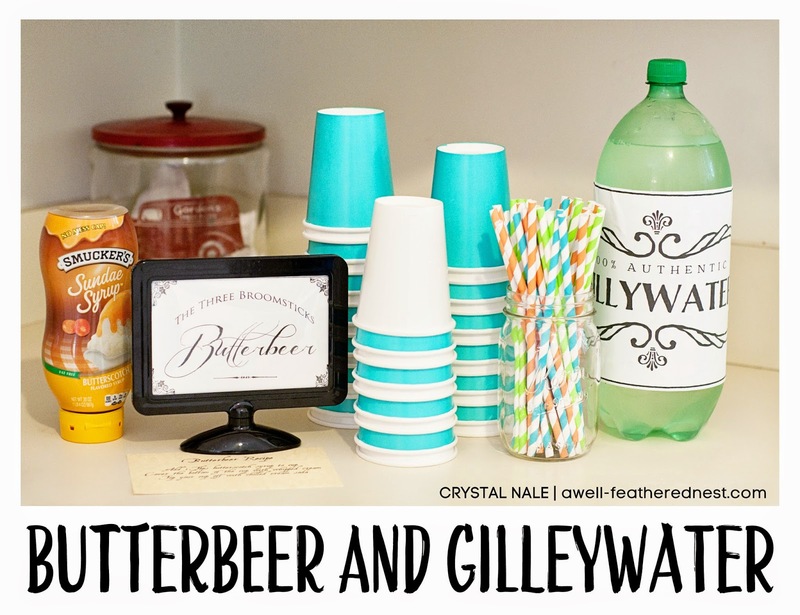 You can catch up with all of my previous Harry Potter party posts, and there will be more to come!